So far, four issues of Uberheroes have been published - both online and in hard copy. 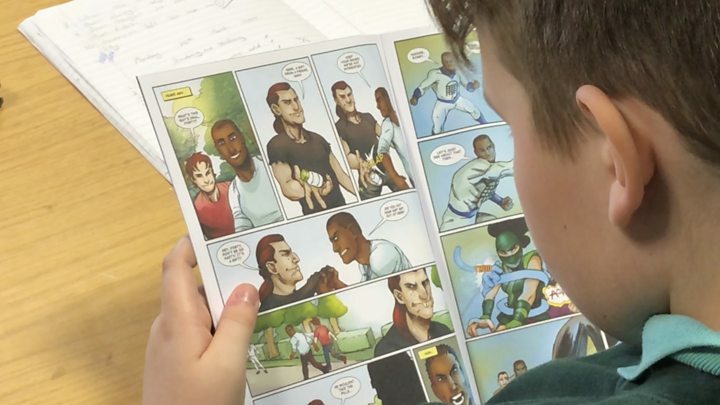 "We could obviously come up with stories that we've made up ourselves, however, we didn't want to do that because we know there are lots of children in Northern Ireland who've actually suffered from the issues we have identified that need covered," said Dee Nixon, chief executive of Hope 4 Life NI, the mental health charity behind the comics. "All of our comic stories are created from real accounts of young people who live here." "We have met them through associations with other groups that we work in tandem with. We'll then go in with some sticky buns, some coffee and have a chat to them. "We'll then create from that recording, a timeline and a narrative which is then sent to the young person for them to approve or amend," said Ms Nixon. "We hammer into shapes some points from Hope 4 Life's clinical position and I bring in a more narrative storytelling position, which can come at odds sometimes," he said. "Sometimes it needs to be more engaging for the children, but sometimes you need it to be more accurate, so there is a bit of give and take there. "They want to get their point across and the bottom line is that it all boils down to what the kid needs from the story, so although storytelling is part of the engagement it still comes secondary to the actual goal," says Danny. "All of them have said how cathartic an experience it has been for them," she said. "They've said it has helped them to know that they have a voice and vehicle to speak out. "When we start the workshops in the schools and tell the kids that these are real stories, it always has a positive and immediate impact on every single pupil in the classroom. "It's been really beneficial for them to know that they have been helping out other young people." "With the age they're at - especially as they're about to transition into secondary school - it's absolutely amazing that there's a programme that does deal with these situations," she said. "I know that the children get a lot out of it - so it's really great to see. "The comic books have been amazing and even in their spare time you can see [the children] taking them out from underneath their desks." "I learned how you're not meant to take drugs and it's useful for the future in case people do offer you things you don't want to take - it's alright to say no," said Shea-Leigh Craig, one of the Oakgrove pupils involved. "The comics were good because you don't know what's going to happen in the future and you need to learn in case something bad does happen." "What the stats are telling us is that young people are facing terrible things because of technology. "Whenever we were in school, it didn't seem to be affecting people as young as primary seven, but now it is. "What we need to do is help youngsters to break the stigma before they even know that there is a stigma surrounding poor mental health."